The following is an analysis of how the Seventh-Day Adventists view key eschatalogical events on their timeline. The Mark of the Beast — Ellen White was equally reckless in determining the meaning of the Mark of the Beast (Revelation 13:16-18). The book of Revelation clearly reveals that this is a mark the Antichrist's false prophet will require people to put on their right hand or forehead in order to buy or sell anything. It is also stated that the mark will be either the name of the beast or the number of his name. Yet, Ellen White declared that the true mark of the beast would be Sunday worship! This is an obvious twisting of Scripture to make it mean whatever you want it to mean. It is the problem you always get into when you start spiritualizing the Word of God. 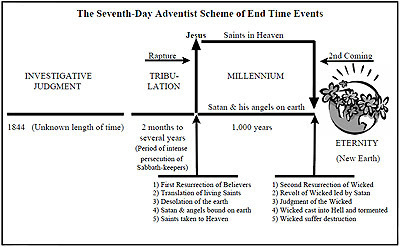 The Rapture — The SDA scheme of end time events places the Rapture at the end of the Tribulation and mixes with it some of the events that the Bible says will occur at the time of the Second Coming — such as the pouring out of God's wrath and the devastation of the earth. In contrast, the New Testament clearly separates these events. In 1 Thessalonians 4:13-18, Jesus is portrayed as appearing in the heavens for His Church. Revelation 19:11-16 portrays Him as returning to earth at a later time with His Church for the purpose of pouring out God's wrath and then establishing His worldwide reign. The Millennium — Placing the Millennium in Heaven is almost as weird as what Amillennialists have done with it by equating it with the Church Age here on earth! The Bible clearly states that when Jesus returns, He will become king over all the earth (Zechariah 14:1-9) and that He will reign over all the nations from Mount Zion in Jerusalem (Isaiah 2:2-4 and Micah 4:1-7). The Bible also promises that He will redeem the earth, not leave it desolate. It will, in fact, be returned to its original beauty and glory, as it existed before the Fall (Isaiah 11:4-9). Nor is there any indication that Satan will be bound on earth for 1,000 years. Rather, Revelation 20:3 says he will be bound "in the abyss." The abyss is pictured in Luke 16:26 as a great chasm located in Hades. Ellen White fancifully interpreted the abyss to be the earth returned to its original state of confusion and darkness.8 I can't help but believe that if God had meant the earth, He would have said earth and not abyss! The concept that the sins of the redeemed will be placed upon Satan when he is exiled to the devastated earth is downright blasphemous! Yet it is clearly taught in the writings of Ellen White.9 This means that SDAs have two saviors. Christ is the sin-offering who dies for sin. The Devil is the one who plays the role of the scapegoat who bears our sins away! The Bible says Jesus was the one who bore our sins (Isaiah 43:1 and 1 Peter 2:24). The Bible also says there is no savior except the Lord (Isaiah 43:11). Incredibly, in the SDA scheme, Satan is our final sin-bearer and therefore plays a vital role in our redemption. Jesus becomes simply a mediator between us and Satan. This is plainly "another gospel" that Paul so strongly condemned in Galatians 1:6-9. During the Millennium, the saints are portrayed as spending their time in Heaven judging the wicked in order to determine their degrees of punishment. The scripture used to justify this concept, 1 Corinthians 6:2, refers to the saints reigning over people on earth during the Millennium. All judgment has been given to Jesus (John 5:22) and will be exercised by Him at the end of the Millennium at the Great White Throne Judgment (Revelation 20:11-15). The Second Coming — At this point, the SDA scheme of end time events finally starts getting a few things right. They assert that Jesus will return to the Mount of Olives, and that is correct (Zechariah 14:1-9). The only problem is that the Bible says this glorious event will occur at the end of the Tribulation (Revelation 19:11-16), not at the end of the Millennium. The SDA also correctly asserts that at the end of the Millennium, Jesus will resurrect the unrighteous dead and pronounce their judgments (Revelation 20:11-15). They are also right when they say that Satan will lead a revolt against Jesus and His Saints. But they are wrong when they contend that his rebel force will be made up of the unrighteous who have been resurrected. That's because the resurrection of the unrighteous does not occur until the rebellion is over and done with. The rebellion is described in Revelation 20:7-10; the resurrection of the unrighteous, described in verses 11-15, does not occur until after this rebellion is crushed. Those who rebel with Satan are people born during the Millennium who never receive Jesus as their Lord and Savior. In the next part of this series on what the Seventh-Day Adventists believe concerning the end times, we'll discover why they despise Catholicism and Israel. 7) Doug Batchelor, Anything but Secret! page 3. 8) E. G. White, The Final Events of Bible Prophecy, page 110. 10) David Reagan, "The Reality of Hell," Lamplighter magazine, (Lamb & Lion Ministries, March-April 2006), pages 3-6. 11) David Reagan, "The Meaning of Heaven," Lamplighter magazine, (Lamb & Lion Ministries, January-February 2006), pages 3-7. Genesis 1:1 In the beginning God CREATED ‘bara’ the heaven and the earth! ‘bara’ means to shape and to form. 1Corinthians14:33 God is not the author of confusion; but of order and intricate detail; and He did not MAKE an earth of confusion and darkness. An awful lot must have happened between Genesis 1 and 2 for the earth to then be described as ‘tohuw’ (formless chaos) and ‘bohuw’ (void, waste). One would think such a ‘woman of God’ would have realised that fact. Also, she should have realised that God, being the creator of all language, would surely know His word of choice! If God had meant ‘earth’; then why choose the word ‘abyss’. Abyss - Abyssos – the bottomless, un-bounded pit of immeasurable depth; an abode of demons and the lost dead. Earth – ge – arable land standing out from the water inhabited by man and animals..
World – 0ikoumene-habitants of earth specifically the part of earth occupied by the Greeks. ‘pit’ - ‘sheol’ – the underworld, hell, abode of the lost dead. ‘earth’- erets – land; the whole globe or districts and countries. ‘world’ – ‘tebel’ – the inhabitants of the earth; hyperbolically refers to Babylon. God means what He says and says what He means and commands ‘do not add or take from His Word’. Examining the cults alongside God's written Word (first the J.W's) was the chosen method by which The Holy Spirit opened up The Word to me; teaching me what I believed, and why I believed it! Sue, if you've ever engaged an SDAer on the subject of the abyss you'll know how they twist Scripture like a pretzel to make it fit their world view. A study of the abyss in Revelation as well as Luke 8:31 and Romans 10:7 etc shows that it can’t be the earth’s surface. But if it isn’t the earth’s surface their whole system fails. Yet it fails logically anyhow. Why bother exiling Satan to a desolate earth so that he can’t deceive nations that are in, what SDAers believe to be, “soul sleep”? Satan had already deceived them prior to their “soul sleep”. Moreover, when the nations are (according to SDA) resurrected, Satan deceives them anyway. It makes no sense at all yet they defend it tooth and nail. Given that these people received this dogma from White, it’s ironic that Batchelor should refer to pretribulationism as a satanic delusion. My Name is Ryan Rogers. I am a Seventh day Adventist Pastor. I have read this article and the comments and would like to extend an open invitation to anyone who would like to study end time events from the Bible. I believe wholeheartedly that the Seventh Day Adventist church correctly interprets Bible Eschatology. I also know for certain that this article does not accurately state the Adventist position. For example, we do not believe that the 2nd coming and the rapture are separate events. I do not challenge anyone so that I might prove them wrong and me right. I invite you to study because I love the truth and the God of it. I have studied these thing and am persuaded of the soundness of the Adventist position. I have not met a single person who have been able to show me where I error from the Scriptures. Contact me if you would like to study. I will listen to what you have to say if you will take time to understand my position from the Bible. Pastor Rodgers i was someone searching for truth with an unbiased mind. Not knowing where the truth would lead me, just praying for guidance along the away. I also looked into the Seventh Day Theology I did not want to go to church on Saturday, i though people were in hell and my grandma was in heaven. Nothin you teach is what i wanted to hear! BUT what i want doesnt matter, I had never heard of a seventh day adventist, but because of the truth of the Bible i am one now. It wont be long and other will see the truth also, i pray it wont be to late. Pastor Rodgers and j den. I'm an Iraq vet and was a seeker of truth regardless of how I felt or my familial traditions. Raised Catholic but knowing there was something wrong in the church I hopped from one non-denominational church to another rapture church. I found the clear ring of truth when I found my now wife and a Revelation seminar in Warren Mi. We were living lives apart from the Lord but His truth brought us into harmony with His commandments and an understanding of true prophetic messages. Numbers 6:24 The Lord bless thee, and keep thee 25 The Lord make his face shine upon thee, and be gracious unto thee 26 The Lord lift up his countenance upon thee, and give thee peace. I pray that those that read and seek the truth regardless of how they feel that they ask Jesus to show them the way and not any other. At the end of days Christ is returning for his church . How does he describe his church? Those who have the testimony of Jesus and keep his commandments. What are his commandments? Are they all the ceremonial laws the Jews had? Surely not ! They are the Ten Commandments. But many including you folks pervert and change the Sabbath keeping commandment to allow you to stay in league with the whore Catholic Church that changed Sabbath day to Sunday . Scripture was referring to ceremonial sabbaths in regard to sacrificial offerings -slaying animals for sin atonement. But Jesus is the ultimate sacrifice so those Sabbaths were now obsolete. However Jesus is the forfillment of the law -he even declared that not one dot of the law was to be done away with. Many / most churches preach that we are to keep the "9" Commandments because Jesus did away with the Sabbath one. Just pick any ole day will do because the disciples had a meeting that lasted longer than just Sabbath day and went into Sunday. Jesus observed the Sabbath His Disciples observed the Sabbath and in his future Kingdom the Sabbath remains! But man choosing to follow human tradition rather than God corrupt scripture to validate this false Doctrine of Devils! Believers in Christ now live under God’s grace and are free from the Law. For instance, take the fourth commandment about keeping the Sabbath. Because of this principle of grace, it becomes not one day that we should set apart for the Lord, but every minute of every day. See how grace frees us from the Mosaic Law, and yet enables us to fulfill it through Jesus Christ? We are now under “Christ’s law” (1 Cor. 9:21), the “law that gives freedom” (Js. 1:25; 2:12), and no longer under the “law of sin and death” (Rom. 8:2). Bear in mind we’re not free to sin (Rom. 6:1-2), but because we are free to worship God in a relationship deeper than do’s and don’ts, you can choose to worship on any day, or every day. The law is eternal and the remnant church is composed of those who keep the commandments and have the testimony of Jesus....If you are not born again, you won't see the kingdom of heaven. The new (spiritual birth) is done by God with the cooperation (willingness) of the soul. The spirit (of God) who dwells in the new born testifies of the love you either have or not have for your creator......."If you love me, keep my commandments" Off course, you can summarize the whole law in two principles because that's where the whole law hangs on: Love your God and Love your neighbor.....but that's just a summary of the whole Law....you still have to honor your parents, you still can't murder, or lie, etc.....And, weather you acknowledge it or not you still have to remember the Sabbath to keep it holy......It was God who wrote it in tables of stone and commanded Moses to deposit the tables in the very ark of the most holy. Jesus came to make God's Law honorable and warned us that NOT a dot or syllable of the Law will be done away with it.......and those who teach the law is been done away with it will be called the least in heaven!!!! Those who say they love God and don't keep His commandments are...LIERS and the truth (Jesus)is not in them. Lucifer's ejection from heaven, Adam and eve ejection from Eden, The destructive flood, the fire from heaven and destruction of Sodom and Gomorrah and off course the end time destruction all come for the same reason....the disregard of God's Law! Don't allow (Jesuit) futurism theology to teach you the truth from heaven....God will become your teacher if you allow him! Praise the creator and redeemer!! !